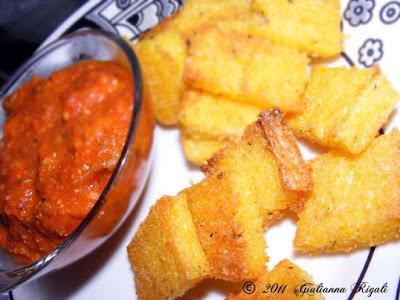 Savory Polenta Recipe, Fried, Grilled, or Soft: Delicious and Naturally Gluten-Free! Always Gluten-Free and can be made Dairy-Free too. “What you call Polenta, we called grits in the South. Polenta is just an Italian’s hyped-up name for grits!” I strolled away, deliberating that I had eaten Quaker Grits countless times for breakfast while growing up. Reflecting on the input, I concluded it must be the “instant” reason they cook so rapidly and effortless compared to Polenta. Stirring La Bella Savory Polenta! No wonder everyone respects/fears the “Mamma” in an Italian family. Do you think the “Godfather” sends shivers through the spines of brave men? Just watch how a grown son trembles when “Mamma” calls him by his entire good Italiano name! Between making Risotto, Polenta, and homemade Pasta, “Mammas” have strong arms from all the stirring and rolling. Her arms and hands are nimble from spending hours talking with her hands. Her words slip off her tongue as quick as a lightning bolt. Don't mess with the Mamma! So what is polenta anyhow? How does it differ from grits or cornmeal mush for that matter? 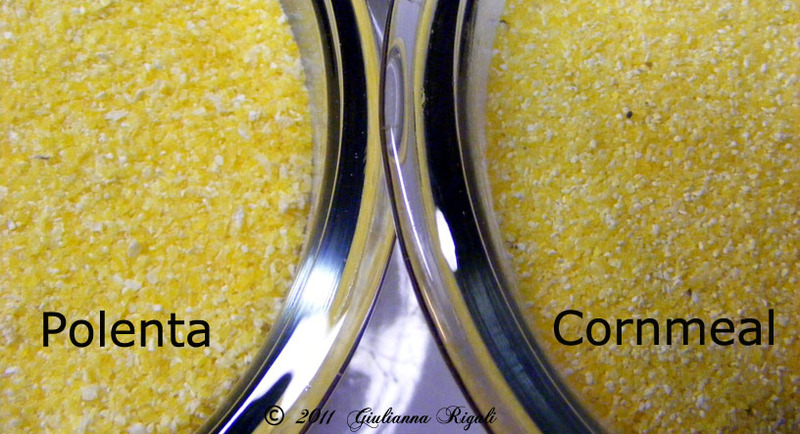 Polenta vs. cornmeal - the difference. Polenta does indeed come from corn, but tends to be stone-ground more finely than cornmeal, thus making it a creamier and smoother dish when prepared. I purchase mine at my local grocery store, Winco, in the bulk, self-serve section. 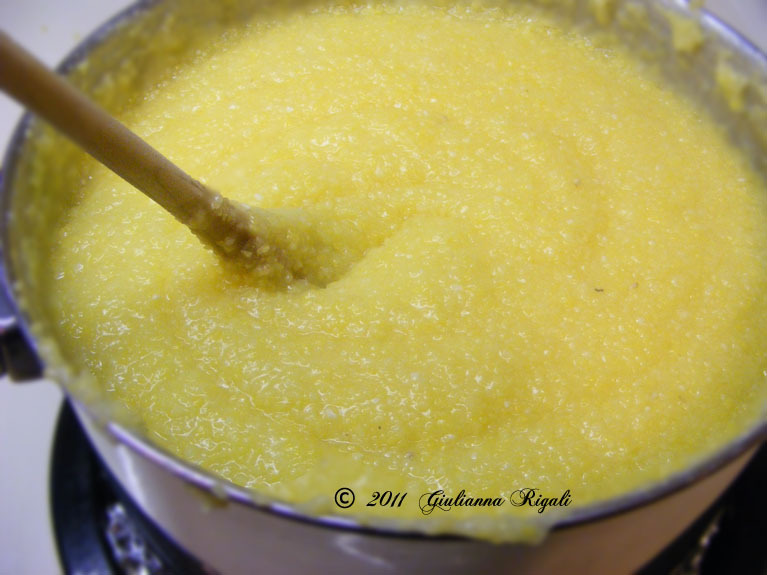 Polenta has its bran and germ intact from the process of grinding. 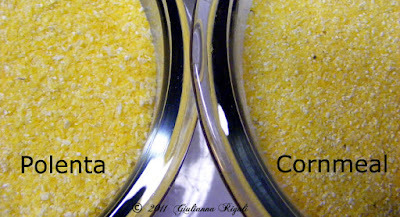 If you look at the photo to the right, you can see the Polenta is flakier than the cornmeal. Click on the photo to enlarge it for better detail. Grits on the other hand does come from hominy. However, hominy comes from corn. This is hulled corn stripped of its bran and germ. Cooks in the South would usually boil the hominy either whole or ground and serve it up much soft much the same as we eat mashed potatoes for a side dish. Before corn made its fashionable arrival in Italy, Polenta was made from ground chestnuts (gluten-free too) or farro (made from certain species of wheat, most commonly Emmer Wheat in Italy). Chestnut flour is still common in many dishes from Tuscany. 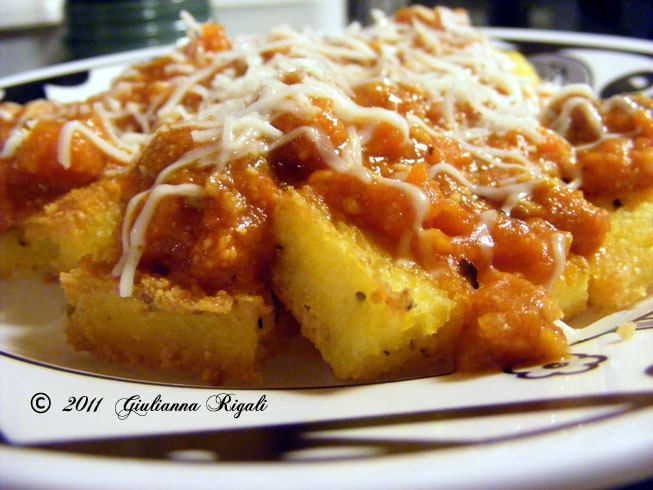 Serving up Fried Savory Polenta with Marinara. Blessed with an amazing son who has autism, who also has a low-tolerance to gluten (he can have some, but not much or he gets intestinal cramps and consequences), we continue in quest of dishes to incorporate. 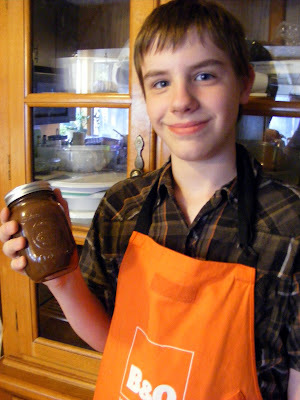 Recipes that our family will enjoy and keeps the gluten down in our meals. Turns out Savory Fried Polenta, dipped in Marinara, (such as Bolognese, as we like our Italian Sausage in our sauce) was a grand slam. 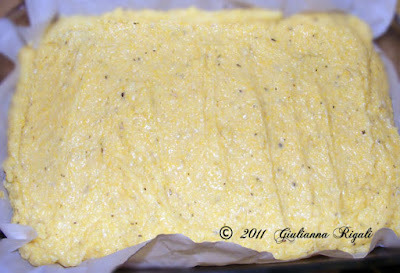 Today, I share with you our recipe for Polenta! Following the recipe are some tips for making it *dairy-free too if needed. To make it even more fun, all you have to do is join in singing “La Bella Polenta” while cooking and eating and your family will be giggling up a storm. What a fun tradition! La Bella Polenta is the last post before this one. 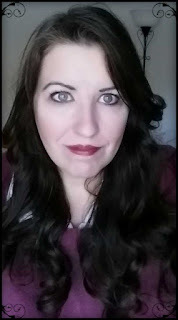 Just click on the keyword La Bella Polenta to the right of this post. Warm the olive oil and 1 Tablespoon of Butter in a heavy saucepan over medium heat. Add the onions and salt then sauté for 4-5 minutes. Turn down the heat a bit and add the garlic and sauté for an extra minute or two. Add the chicken stock, milk, and water. Turn up to medium high and bring to a boil. After liquid is boiling, gradually whisk in the Polenta meal. Reduce the heat to low and continue to stir while cooking until the mixture is thick and the Polenta meal is softened, about 15-25 minutes. Remove from the heat and stir in the butter, pepper, and then the Parmesan cheese. You can eat as is or now spread it into a parchment paper lined 13X9 cake pan, and cool completely in the refrigerator. When Polenta is completely cooled you can cut it into squares or rectangles. Brush each piece with olive oil and fry or grill. You can sprinkle each piece with more Parmesan while blotting excess oil on paper towels. My kids prefer to dip their Polenta in the marinara while I prefer my Marinara poured on top like in pasta dishes. *To make this dairy-free: Use 2 Tablespoons of Olive Oil to sauté the onion and garlic. Eliminate the 2 cups of milk, by using either 2 cups of unsweetened, plain almond milk or 2 extra cups of chicken stock. Eliminate adding the butter and Parmesan at the end and add extra salt or seasonings to flavor.